Ever feel that the Americanisation of the globe is not in your best interests? That the technological western whirlwind in which we live might not be the most fulfilling way to spend your time? French director and comic genius Jacques Tati was thinking along these lines almost sixty years ago when he and his screenwriter buddy Henri Marquet created their first feature film Jour de Fete or Fair Day. During the occupation of France, the pair had moved a remote rural village called Sainte Severe-sur-Indre to avoid being recruited by the Germans. Soon after liberation, they returned to the village to shoot the story of a drab little town transformed by the bright colour of the annual carnival. Our guide through the 24 hours or so is a hunched over, old crone who predicts trouble from the very outset and so it transpires when Francois, the local postman, peeps through the flaps of a side show tent and witnesses a newsreel about the efficacy of the U.S. postal system. Yankee posties are seen riding motorbikes through hoops of fire and parachuting out of the sky, all in the line of duty. 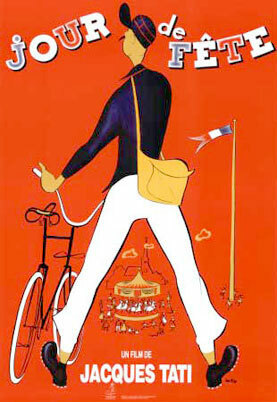 And so, goaded on by carni folk and villagers alike, he sets out to replicate their feats on his trusty bicycle. Pedalling faster and faster, he is soon found heading up what appears to be the Tour de France, dropping off letters as he goes. It’s classic, slap stick stuff, along the lines of Chaplin and Keaton, only Tati took it one step further by filming his work in colour. Using what were then highly experimental techniques, he ameliorated the risk by shooting with a second camera in black and white. It was a wise call as he was unable to make a print of the colour version and it was only in 1995, under the supervision of his daughter and editor, Sophie Tatischeff, that his original vision was finally realised. But whether in colour or black and white, the basic story remains; progress or no progress, the world wont turn any faster. And, as the old crone says, “Americans are a law unto themselves.” There’s no point trying to emulate them.